Dallas was awesome and once again many people gave their lives to Jesus. 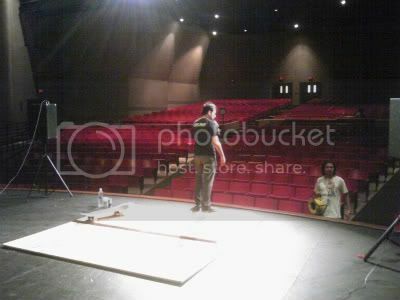 This pic is of my friend Oscar doing a sound check before my message and demo. This is what the stage typicallly looks like. That square is where I will rattle out over 80 tricks in my 25min. routine and then give a 20-25 minute message. About 7 years ago, I created a way to perform and skate in a small area so that I could easily travel and have a job skating and sharing Jesus. To make what I do relevant and more inviting to local skaters, I challenge them to duplicate a specific combo of mine. The catch is they only get one shot. If they make it they win $100. I haven’t had anyone do it yet…..Thank God.